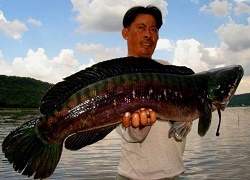 Our Giant Snakehead fishing holidays at Khao Laem Dam in Thailand allow fishing for Giant Snakehead in the pristine surroundings of one of Thailand’s most beautiful regions and National Parks. Anglers fishing for Snakehead at the famous Khao Laem Dam in Kanchanaburi province for Giant Snakehead and various other native predatory species will be picked-up at Bangkok airport or their Bangkok hotel by a Fishsiam representative. Anglers will be transported to Kanchanaburi in an air conditioned vehicle through some of Thailand’s most scenic and rural scenery before arriving at your destination approximately four hours after departure. Khao Laem dam is a gigantic reservoir formed by the introduction of a huge hydro electric dam effectively blocking the nearby River Kwai Noi. The reservoir has a length of over sixty km’s at its longest section and a width of over twenty five km’s at its widest part with variable depths and secluded bays dotted around its perimeter. Sunken forests and submerged root systems lay home to various native predatory species giving cover from unseen prey to ambush predators such as the Giant Snakehead and the highly aggressive Hampala Barb. Khao Laem is a place of immense natural beauty its banks being lined by dense rain forests and jungles which are home to an abundance of wildlife, flora and fauna. On arrival at the reservoir anglers will eat a light lunch before being equipped with all necessary fishing equipment. Spinning Rod, Reel, leaders and lures. Anglers will have the exclusive use of a traditional longtail boat captained by a local boatman and have a Fishsiam pro guide in attendance throughout their stay. Your guides will advice you on productive areas to fish and transport you to the numerous inlets and sunken forests as you attempt to capture the wily and Aggressive predators which reside in this vast freshwater ocean. After fishing until dusk the angler(s) will be transported back to floating fishing bungalows stationed on the banks of the lake for dinner and basic overnight accommodation. Anglers will commence Snakehead fishing at Khao Laem Dam at 5.30-6.00a.m with your Fishsiam Thailand guide and local boatman and continue to explore the reservoir. Anglers will fish until 11.00a.m. Before returning to the floating raft around noon for a light lunch. Fishing will resume again from 2.30-3.00p.m throughout the afternoon until dusk. At the end of your days Snakehead fishing anglers will return to the onsite floating bungalows for dinner and overnight stay. The third day Snakehead fishing at Khao Laem Dam in Thailand will start 5.30-6.00a.m with your Fishsiam guide and local boatman continuing to explore the reservoir. Anglers will fish until 11.00a.m. Before returning to the floating bungalows around noon for a light lunch.After a few more hours fishing anglers will be picked up by an air conditioned vehicle at 3.00p.m. before heading back Bangkok. This venue responds well to various techniques including lure fishing, bait casting and fly fishing tactics and is suited to experienced lure fishermen with a sense of adventure and love of nature.It is advised that anglers wear long sleeve shirts and caps to allow some protection from the sun and bring wet weather clothing during the wet season.Our team of highly experienced guides and boatmen has excellent local knowledge giving the angler the highest possibility of success.With the wild and vast nature of Khao Laem Dam and the constantly changing fishing conditions it is recommended that you contact us with regards to the best times to visit this venue. 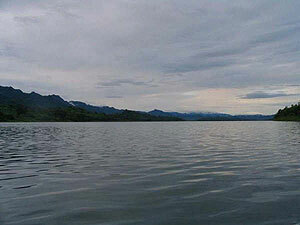 Our Snakehead fishing tours to this stunning venue are designed exclusively for 1-2 anglers per trip/boat. For larger groups of anglers booking is required to be completed 1 month in advance. Thailand Giant Snakehead fishing trips to this venue can be combined with our other Thailand fishing holidays in a multi venue package to suit the anglers specific fishing requirements. Make your booking or enquire for further details.